Be whisked away to the Arabian markets filled with delightful little trinkets and treasures as you play our online slot casino - Wild Bazaar. Wild Bazaar is a 5 reel, 26 payline slot created by NetEnt. It has an Arabian adventure theme which is filled with so much fun. You can play this slot on all devices including your mobile and tablet for as little as 20p per spin. The design is fairly simple but is filled with rich colours of purple, turquoise, and blue. 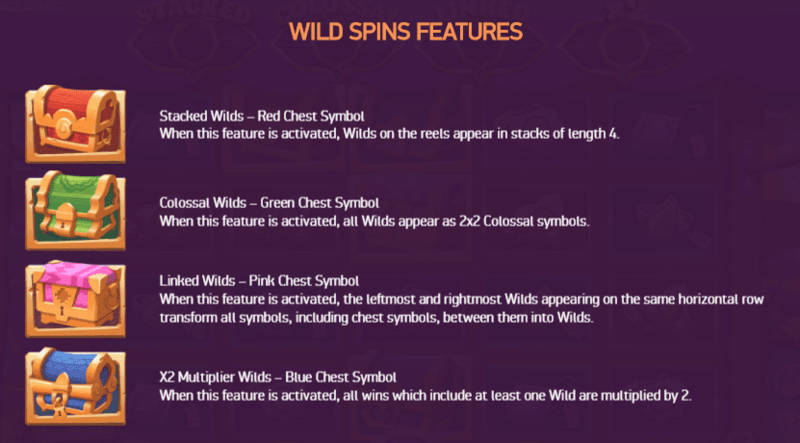 Wild Bazaar has some great rewarding features including wild spins, stacked wilds, and 2x2 colossal wilds. Feel like Jasmine or Aladdin as you venture through the Arabian markets. 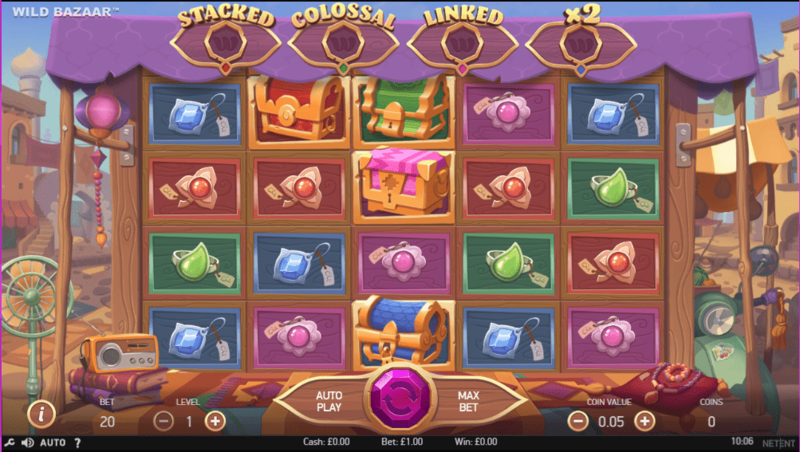 Wild Bazaar is a 5 reel, 26 payline slot created by NetEnt. It has an Arabian theme and a vibrant, fun, jewel-filled design. As you explore the depths of the markets, you'll find many hidden gems and trinkets. Behind the reels, you'll find the beautiful Arabian market where people are haggling to get the best price on handmade shoes amongst the aroma of incredible spices, multi-coloured fabrics, and various other random items. Symbols include different coloured treasure chests and sparkling pieces of jewellery. If you're looking for top-rated online slots with Arabian themes, this can be one of your options! Stacked Wilds feature - Activate the stacked wilds feature by landing 3 or more red treasure chest symbols. Wilds will appear on the reels in stacks of 4. Colossal Wilds feature - Unlock the colossal wilds feature by landing 3 or more green treasure chest symbols. All wilds in this feature will appear as 2x2 colossal symbols. Linked Wilds feature - Trigger the linked wilds feature by landing 3 or more pink treasure chest symbols. The wilds on the far left and far right side will appear on the same row. All symbols in-between these wilds will turn wild. X2 Multiplier Wilds feature - Activate the x2 multiplier wilds feature by landing 3 or more blue treasure chest symbols. All wins during this feature will receive a 2x multiplier. Wild Bazaar is a fun slot filled with lots of special hidden treasures. Will you be lucky enough to find them? The design is bright and simple and the Arabian style soundtrack sets the mood for hunting out treasures perfectly. This NetEnt comes with a great set of features that pop up frequently which is great for small wins. These are also available in Centurion.